But there’s something strangely compelling in the simplicity of an older bike from less complicated times. And they don’t come more stripped down than this 1972 T120 from Pitstop Motor Werk. 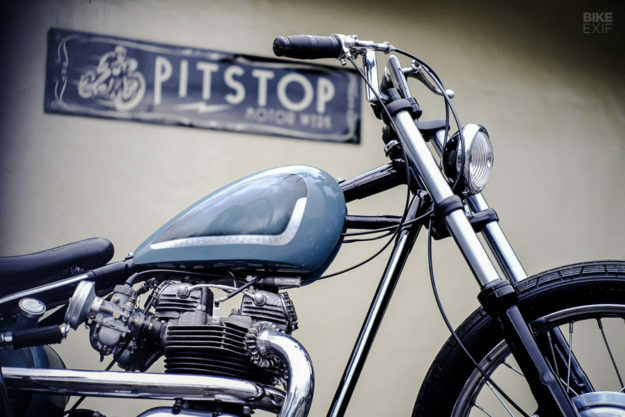 Pitstop is a team of three led by an Indonesian builder called Agung. 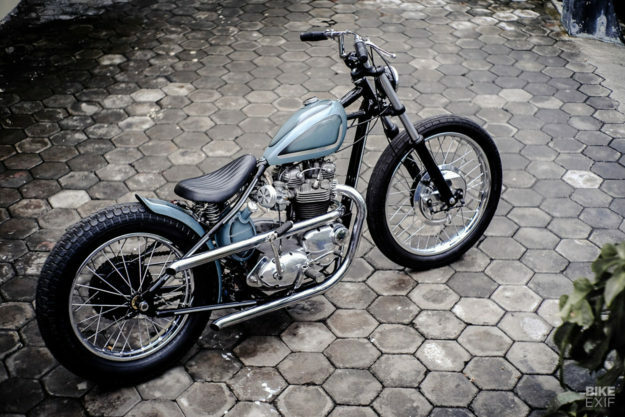 They’re based in the hot and humid province of Central Java, and like most Indonesian builders they have to be incredibly resourceful and thrifty. Yet this does not seem to affect the quality of their work. This Bonneville is actually a T120R, one of the lesser-known Meriden models. 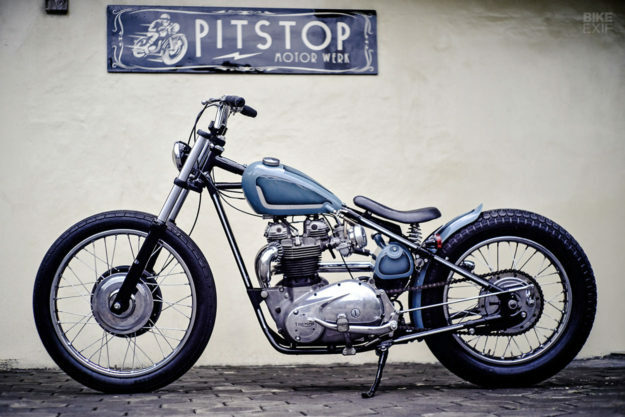 It was an export version of the base bike, and branded as the ‘Bonneville Speedmaster’ by dealers in the USA. It’s not an especially well-documented model, but the fuel tank was smaller and the bars had a slightly higher bend. 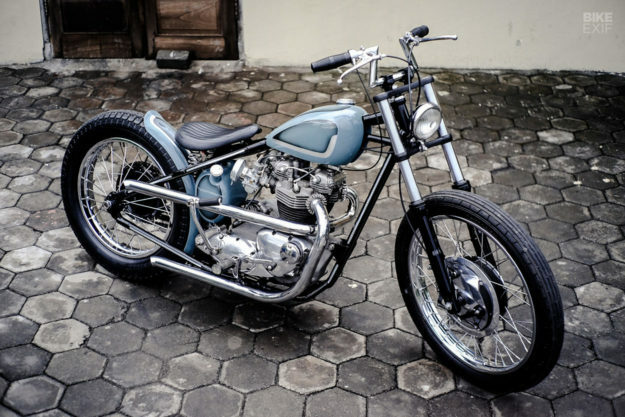 Instead, he imported an engine from the USA, and decided to build a bike around it. 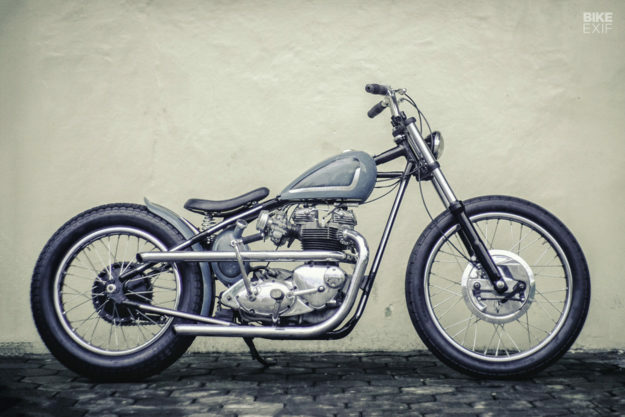 He describes his vision as ‘minimalist chopper’ but we’d say it’s just as much a bobber. The exhaust was a much simpler job: two straight shootin’ pipes, one set high and one set low. The heavy lifting is in the frame, which is entirely hand-made and fashioned from seamless 28mm steel tubing. It’s hooked up to an old school hardtail back end, but the front end is much more contemporary—the forks are from a Kawasaki Ninja 250 and are a surprisingly discreet addition. 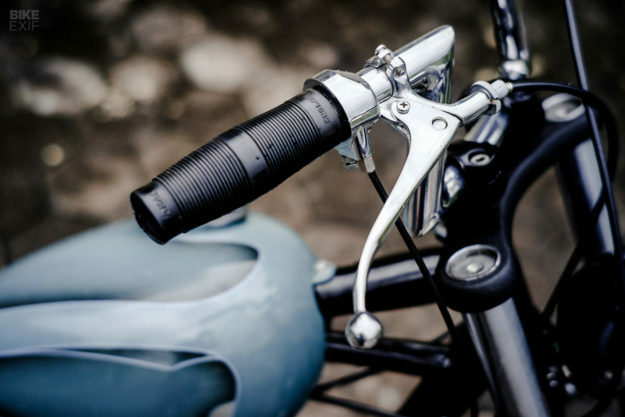 They’re topped with compact hand-made Z bars, with an equally compact Bosch headlight nestled up tight against the neck stem. The front rim has gone up a couple of sizes from the T120R original to 21 inches, but the rear stays the same at 18. 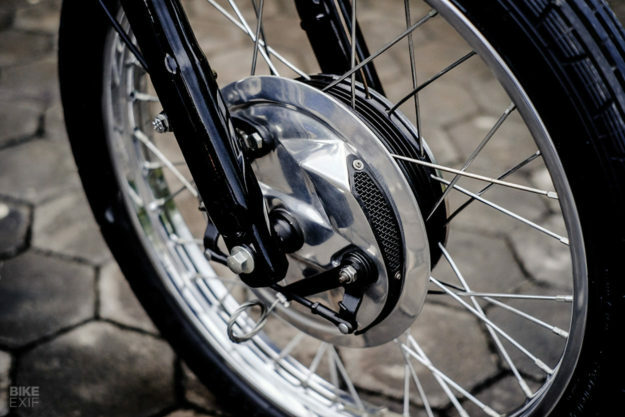 They’re shod with Swallow and Unily tires, popular brands in Southeast Asia that sell mostly vintage patterns. 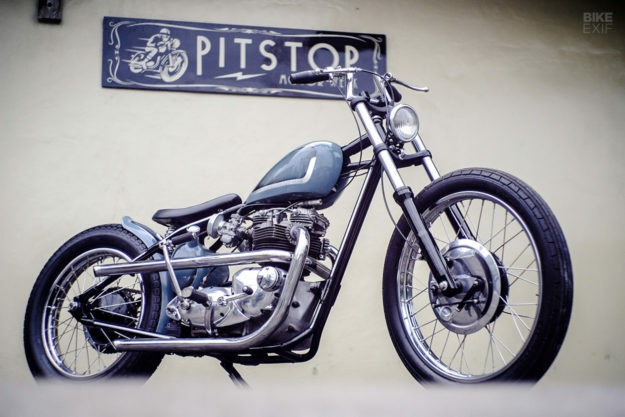 The delicate bodywork—a tiny peanut tank and a rear fender with a little old school upkick—is hand-made from galvanized steel sheet, and expertly painted in blue and warm grey tones by Danny P of Hacka Pinstriping. 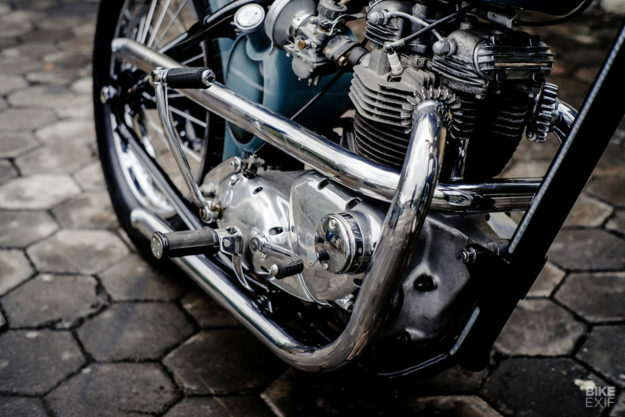 It all harks back to the days when a motorcycle was little more than an engine, a frame, and two wheels. 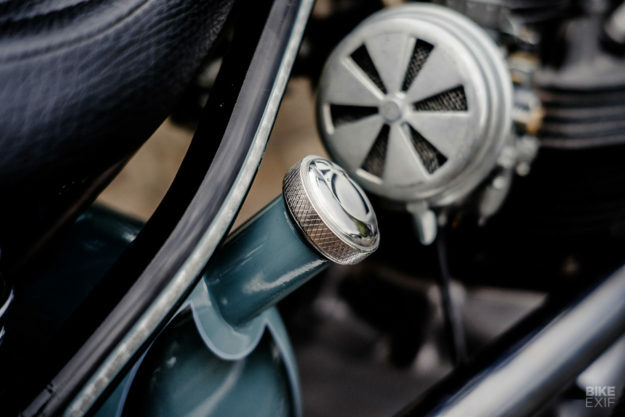 And much as we love riding modes and ABS and traction control, we still find the charm of a vintage Bonneville custom absolutely irresistible.